The Delta Wujiang Data Center project is the world’s first to achieve certification under LEED v4 for Interior Design and Construction: Commercial Interiors. 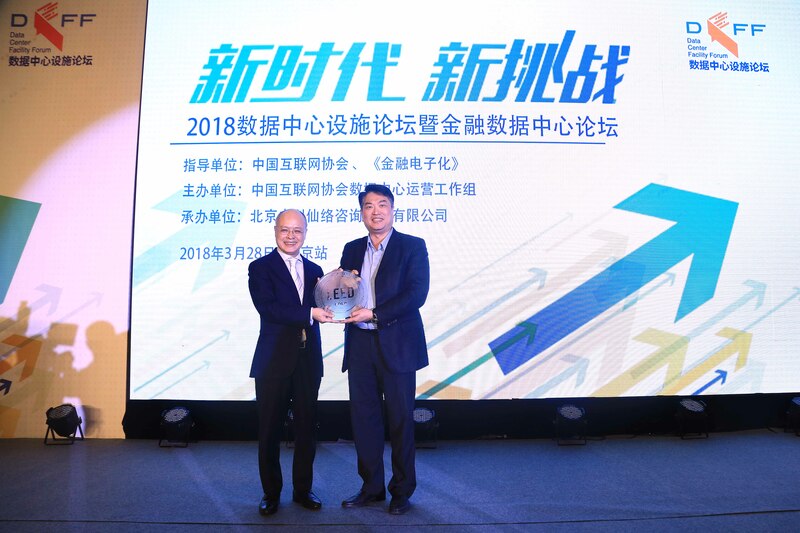 On March 28, Andy To, Managing Director of North Asia, USGBC and GBCI, attended the Data Center Facility Forum in Beijing and presented the LEED Gold certificate to You Wenren, Managing Director of Delta Group, recognizing Delta’s accomplishment. The Wujiang Data Center is one of Delta’s key buildings in China. In order to protect its various working systems, such as ERP, emails and other important IT applications, the project team has to consider not just how to save energy, but also how to ensure the reliability and stability of its power system. Through a high-efficiency power system, modular cabinets, an infrastructure management system for the data center and renewable energy and chilling systems that are adapted to local conditions, the project achieved 1.29 for its Power Usage Effectiveness (PUE) performance from 2015 to 2018. As a power solution provider, Delta Group is dedicated to energy-saving solutions and environmental protection. In the past 11 years, Delta has contributed to 26 green buildings worldwide, six of which are located in China. Buildings certified in 2016 helped reduce over 10,000 tons of CO2 emissions.